In this section we will use the CIViC interface to identify variants of interest for custom capture. The interface will then be used to download variants of interest, associated clinical descriptions, and curated coordinates. 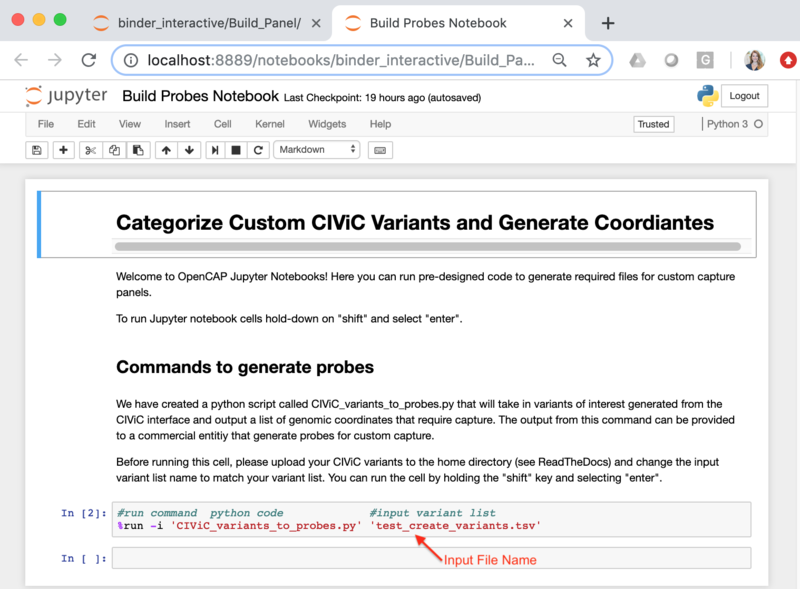 We will then open an interactive jupyter notebook to reformat the variant coordinates for probe development. 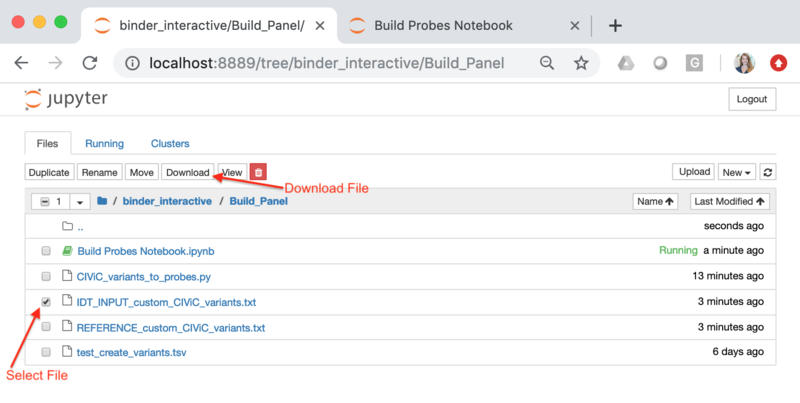 The output from this exercise will be a file that is compatible with commercial probe development companies for custom panel development. The CIViC database is constantly being updated with new evidence statements and assertions. Therefore, we have provided a real-time query interface that allows users to build a pool of variants required for custom capture. 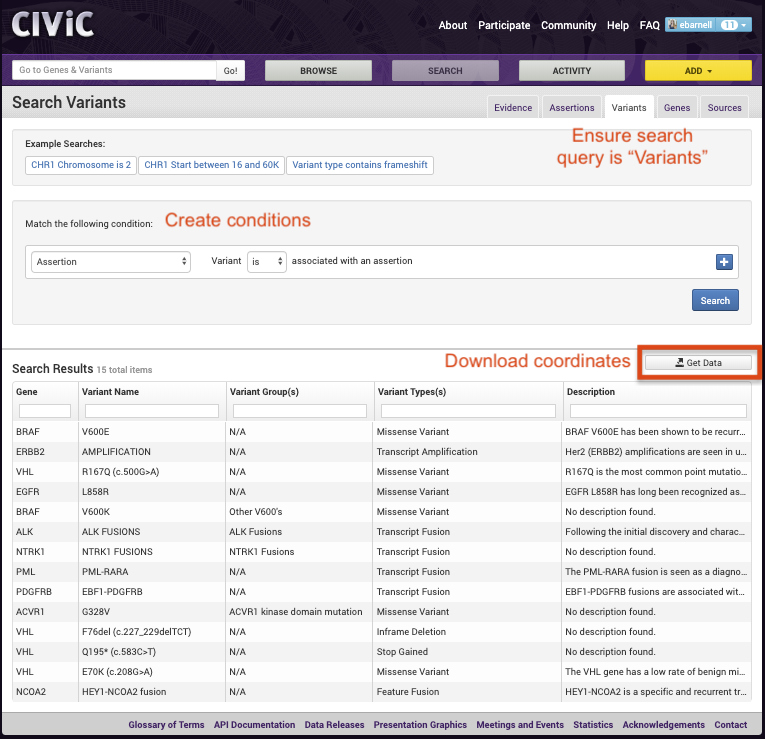 This interface can be accessed by going to the CIViC website, selecting the “SEARCH” button, and navigating to the Variants” tab: `SEARCH-Variants. Although this screenshot provides one method to create a variant pool, there are many other examples of criteria that can be useful for identifying variants. Below we have provided a few additional examples of fields that might be helpful for building variant prioritization conditions. Each field has an associated description and links to help documents if applicable. 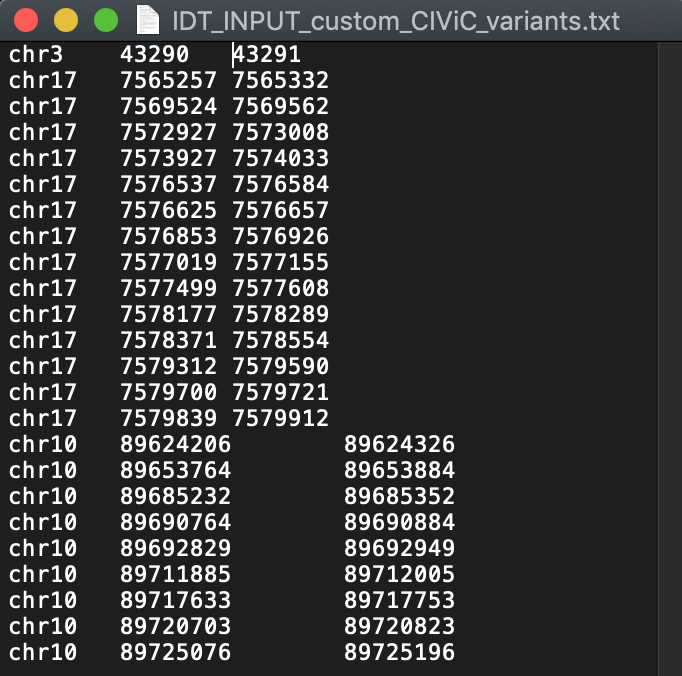 The CSV file developed using the CIViC Search interface contains the genomic coordinates that encapsulate the variants of interest (i.e., Custom CIViC Variants). Each line in this file represents a single variant that requires probe development. However, before designing probes for these variants, we must further categorize each variant by variant length. This can be accomplished by using CIViC curated coordinates (i.e., variant start position minus variant stop position plus one). If the variant length is less than 250 base pairs, the variant is eligible for hotspot targeting. If the variant is >250 base pairs, the variant requires tiling of the protein coding exons. For variants that require tiling, there are two different types of tiling. For variants that are large-scale copy number variants (e.g., “AMPLIFICATION”, “LOSS”, “DELETION”, etc. ), sparse tiling is appropriate. Sparse tiling requires creating approximately 10 probes spread across all protein coding exons. For variants that are bucket variants, (e.g., “MUTATION”, “FRAMESHIFT MUTATION”, etc. ), full tiling is appropriate. Full tiling requires creating overlapping probes across the entire protein coding exon(s). 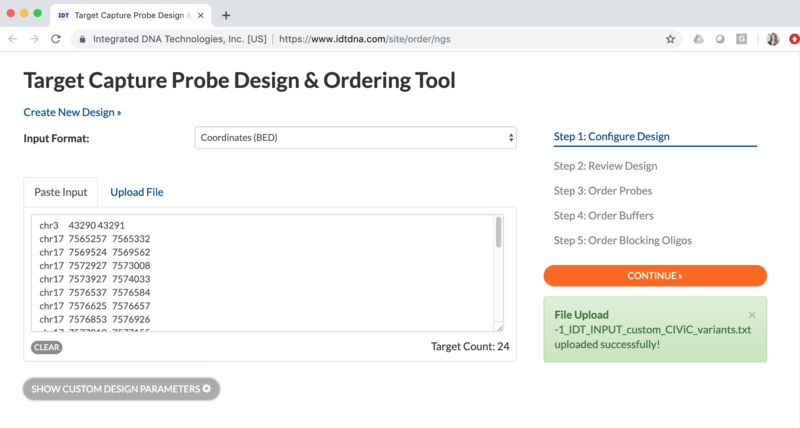 We will demonstrate custom capture panel development using the IDT Target Capture Probe Design & Ordering Tool. First, under “Input Format”, select the “Coordinates (BED)” option. Next, select the “Upload File” option and click on the upload human genomic coordinates button. Upload the file that was prepared using the CIViC interface (INPUT_custom_CIViC_variants.txt). Once the files are successfully uploaded, select the “Continue” button to develop the reagent. Of note, you must be logged into the interface to continue with this process. The next steps include reviewing the design, ordering probes, ordering buffers, and ordering blocking oligos. Once the panel design has been reviewed, you can purchase the reagents through the IDT interface.